After making Sprout Salad with Citrus and Pomegranate I found that I had a small amount of the salad left over. I hate wasting food and after the success of my recent Iranian Lentils, Peppers and Egg brunch I wondered whether I could turn this salad into something similar although the ingredients were totally different. I had a half carton of cottage cheese in the fridge so I combined the cheese with the sprout salad and mixed well then popped the mixture into a frying pan with a dash of olive oil, spread it out a little and cracked an egg on top. I left the sprout mix over a medium heat for about 10 to 15 minutes, until the egg was perfectly cooked and the mixture was sizzling and hot. The delicious aroma reminded me a little of an old-fashioned bubble and squeak with a citrus tang. My husband declared his supper a success and exclaimed that the sprout salad was just as tasty hot or cold. The bottom of the mix was a little browned and crispy and the egg perfectly complimented the cheesy sprout mixture. A perfect supper using up the left-overs. 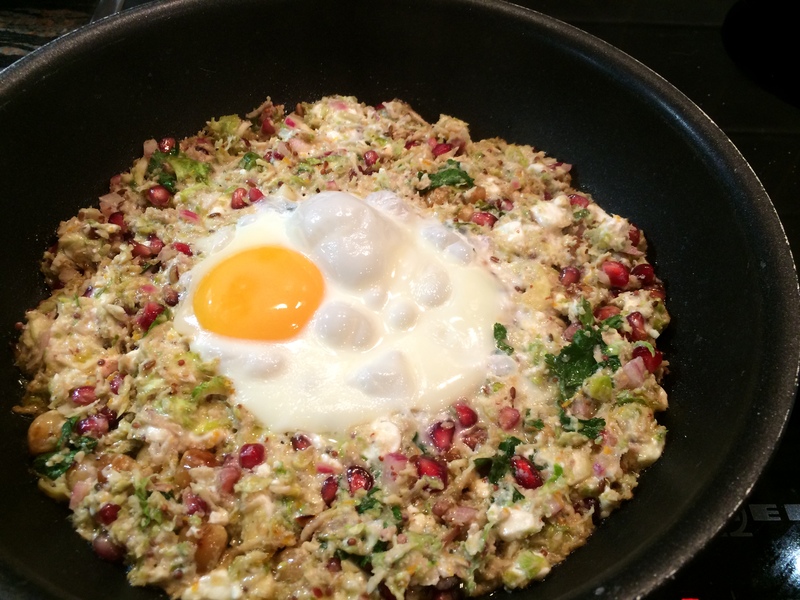 This entry was posted in Brunch, Salads, Supper and tagged Brussel sprouts, Cottage Cheese, Egg, Gluten Free, Hazelnuts, Healthy Eating, Lunch, pomegranate, Supper, Wheat-Free. Bookmark the permalink.